Exposed to everything from cooking grease to children's sticky fingers, kitchen cabinetry slowly but surely builds up stubborn accumulations of dirt and grime. Fortunately, with a simple, effective mixture of common, non-toxic ingredients, you can restore the look of your cabinets, quickly and with relative ease. In any home, no matter its age or design, the kitchen always seem to serve as the hub of daily activity—a gathering spot not only for household occupants, but also for the spills and stains that collect on floors, counters, and even cabinets. There are plenty of store-bought cleaners capable of removing stubborn, deeply embedded grease and grime from cabinet doors. But you can also DIY your own solution using nothing more than a few pantry staples. You’ll need a bucket, warm water, baking soda or vinegar, and a few microfiber cloths. To begin, fill the bucket three-quarters full with warm water. Next, mix in a couple cups of baking soda or alternatively, a few splashes of vinegar. Now dip a microfiber cloth into the bucket, twist the material, and squeeze to remove any excess water. You want the cloth to be moist but not dripping wet. 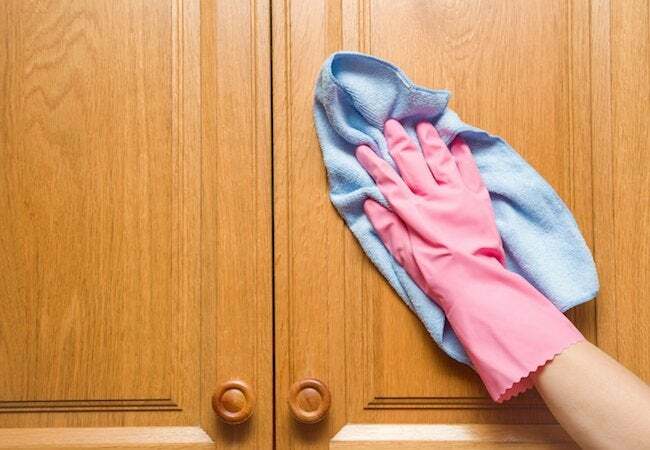 Before proceeding, first test your DIY cabinet cleaner in inconspicuous area in order to be sure that it doesn’t cause any harm to the cabinet finish. Safe to proceed? Wipe down all the cabinets and all their hardware, remoistening the cloth with the cabinet cleaning solution as often as needed. Once the cabinets look clean, remove cleaning residue by wiping everything down with a fresh cloth moistened in plain tap water. Finally, wipe the cabinets with a fresh, dry cloth so as to leave them moisture-free as well as freshly cleaned.